Learn how you can see better after cataract surgery! Cataract patients now have an option to see at both near and far distances after cataract surgery! Individuals suffering from cataracts previously had only a mono-focal lens implant option after surgery. NEW multifocal IOL technology can decrease dependence on glasses after surgery. Our eyes are always adjusting and constantly focusing on objects up close, far away, and in between. The ability for our eyes to change focus from far away to up close is called accommodation. As we get older, this ability decreases, and we become dependent on bifocals or reading glasses. Dr. Garrett offers the ReSTOR premium lens implant to provide his patients with quality vision at a range of distances by combining the strengths of different technologies. The ReSTOR IOL lens is an artificial lens used to replace the natural lens of the eye. The natural lens is removed during cataract surgery. It is made of a flexible material that allows the lens to focus light on the retina for clear vision at near, far, and intermediate distances. ReSTOR can affect the quality of vision, providing patients with clear images at all distances, and increase the quantity of vision by allowing you to see at all distances. ReSTOR is a lens that will help treat patients suffering from presbyopia and from cataracts. The ideal candidate for ReSTOR lenses is someone who is seeking better vision at all distances, and wants to reduce, and possibly eliminate their dependence on glasses. If you are interested in learning more about the ReSTOR lens, please contact us to schedule an appointment and speak directly with the doctors at Garrett Eye. Toric IOL corrects astigmatism in a patient’s eye to provide better vision after cataract surgery. The Toric lens is specialized lens that corrects the curvature on a patient’s cornea and significantly improves uncorrected distance vision independent of glasses or contact lens. The Toric lens is made of a biocompatible lens material that has already successfully been implanted in more than 25 million eyes since 1991. The Toric lens is a premium implant and there is an additional fee above Medicare coverage for it. 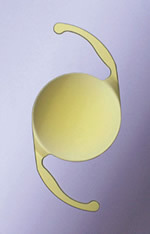 The TRULIGN Toric intraocular lens is intended for the visual correction of astigmatism secondary to removal of a cataract in patients with or without presbyopia who desire reduced astigmatism with increased glasses independence and improved uncorrected near, intermediate and distance vision. The TruLign Toric lens is a premium implant and there is an additional fee above Medicare coverage for it. Astigmatism means that an eye’s surface (cornea and lens) is spherical and is shaped like a football. Normal eyes are round and shaped like a basketball. If astigmatism is not corrected, patients will have blurred vision after standard cataract surgery, and will need glasses or contacts to correct their vision. Surgical options to correct astigmatism include: Limbal Relaxing Incisions, Toric IOL and Excimer Laser Refractive surgery. Ask Dr. Garrett today to find out if you are a candidate for this special lens that can help eliminate your astigmatism! These IOL (intra ocular lens) choices by Tecnis are the first and only extended depth of focus presbyopia- correcting implants, which provide clear vision at any distance. This IOL provides a range of high quality vision from near to far and points in between which reduces the frequency of wearing glasses. With correcting chromatic aberration (color distortion) it grants sharp vision in all lighting. This implant choice is also available in the astigmatism correcting Toric version. This is the world’s smallest medical implant. iStent by Glaukos treats glaucoma at the time of cataract surgery by further reducing eye pressure by creating a permanent opening in the trabecular meshwork. This allows the fluid in the eye to move more easily. The procedure is indicated for adults with mild to moderate open- angle glaucoma currently treated with ocular hypotensive medication. It is 20,000 times smaller than the intraocular lens that the doctor inserts during cataract surgery. This procedure is covered by health insurance and may reduce dependency on pressure lowering eye drops, saving the patient time and money. “Once in a Lifetime” opportunity to have the kind of vision you had when you were younger! Crystalens is the first and only FDA-approved accommodating intraocular lens that uses the natural focusing ability of the eye. Crystalens can treat both a person’s cataracts and presbyopia (loss of near and intermediate vision). Crystalens was designed to perform like the natural lens in your eye. It uses the eye muscles to flex change their shape inside the eye (accommodate), in order to allow the eye to focus on objects that are near, far, or in-between. No current technology can totally eliminate eyeglasses. However, the accommodating lens should allow you to focus across a greater range of different viewing distances without glasses when compared to a conventional single-focus lens implant. In many cases, Crystalens can reduce or eliminate glasses for most activities including: reading a book, working on the computer, playing the piano, cooking, and driving a car. Crystalens is a premium lens, and there is an additional fee above Medicare or insurance coverage. Please check with our billing staff for the fees and financing options that we offer for Crystalens. In the past, when an artificial lens called an intraocular lens implant, or “IOL,” was placed inside the eye during cataract surgery, it did not have any power of accommodation. 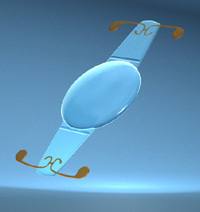 These IOL’s are called single focus IOL’s and allow the eye to see either far away or close up, but not both. Unlike these conventional lenses, the accommodating lens implant gives you some ability to naturally change and adjust your focus by flexing inside the eye, thereby reducing your dependence on eyeglasses.